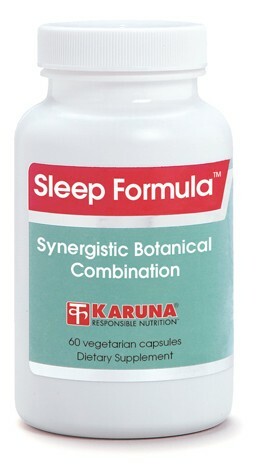 Sleep Formula synergistically combines several herbs that help support healthy sleep and a calm mood, both of which are essential for many aspects of daily functioning and comfort. Valerian, passion flower, skullcap, lemon balm, and hops have a long history of use to support healthy sleep. Double-blind clinical trials have shown some of these herbs, alone or in combination, to be as effective as more chemical-based agents, but without causing daytime sleepiness. These herbs have actually been shown to increase alertness, at least in part by improving sleep quality. They can also help support a calm mood and are documented to be nontoxic and free from side effects, even for children. Valerian, passionflower, skullcap, lemon balm and hops have traditionally been used to enhance sleep quality (Arch Gen Psychiatry 1998;55:1033-44). Valerian possesses several mechanisms for calming neuronal activity, including the potentiation of the effects of the relaxing neurotransmitter GABA (J Pharm Pharmacol 1999;51:505-12). Combining of valerian with either lemon balm (Psychopharmakotherapie 1996;3:123-30; Therapiewoche 1992;42:726-36) or hops (Eur J Med Res 2000;5:385-90; Wien Med Wochenschr 1998;148:291-298) has been effective for promoting sleep without side effects of daytime withdrawal or sedation. Sleep Formula is safe for use in all age groups, is not addictive, does not impair the ability to drive or operate machinery (Pharmacopsychiatry 1999;32:235-41; Zeits Allegmeinmed 1995;71:1215-21), and does not interact with alcohol or other drugs. Suggested use for adults: 1-2 capsules one hour before bedtime, or as directed for sleep, or one capsule three times daily, or as directed for a calming effect.